See below for more information about several of the permanent art installations and exhibits on site. For information on temporary art and exhibits, please visit our What's On calendar. Nestled is a sculptural art piece and light fixture created by hand-weaving sustainably harvested sumac branches into a form resembling birds' nests. The organic, twisted nature of the branches offers a contrast to the industrial character of the metal roof rafters. The lighting in the woven structure creates a dynamic element to the piece, as the shadows it casts move throughout the day. As with all things found in nature, Nestled is in a constant state of flux as it responds to changes in its environment and affects the space around it. Flood Lines addresses the increasing frequency of heavy rainfall events in our contemporary climate by creating a spatial dialogue between three cisterns and the roof of The Pavilions in which they collect water from. 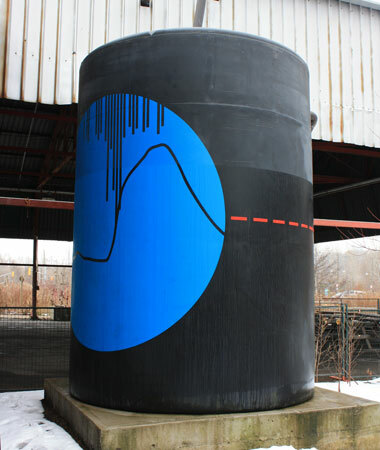 Artists Paul Aloisi and Dan Bergeron have graphically interpreted hourly rainfall data in comparison with Don River storm surge data to render three circular paintings oriented towards a central viewpoint directly beneath the peak on the roof of The Pavilions. 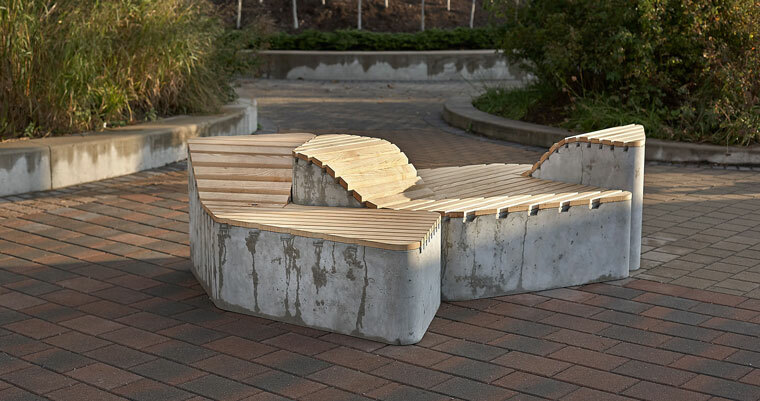 An innovative modular public seating solution made from salvaged and sustainable materials. Cayuga’s gently sloping, rolling shape recalls the layers of glacial till that form the landscape in this part of southern Ontario. The base of the seating, made from a sustainable composite material of cement and reclaimed wood chips, was manufactured in way that echoes the brick making technology once used at Don Valley Brick Works. Winner of the 2014 Design by Nature competition. Nine archival photographs illustrate how brick-making at this site contributed to the building of Toronto, and how geological layers exposed in the quarry revealed glacial deposits over the past 400 million years. The images, some dating back to the 1890’s, remind us of Toronto’s long and vivid history, both industrial and natural. A tribute to A.P. Coleman, who found evidence of ancient periods of climate change in the layers of deposits on the North Slope of the quarry. 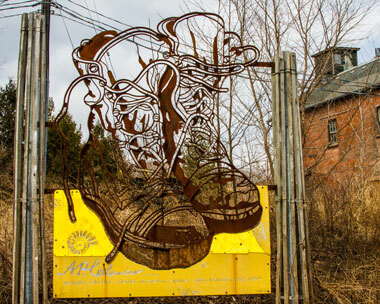 This sculpture, which depicts a pair of Coleman’s boots, speaks to the relationship between the natural world and industry by recalling the products and remnants of their interactions. Watersheds are areas where all waters drain to a common body of water. “Where is your watershed address?” is the question this installation asks, as it depicts the rivers that flow through city and raises awareness about our extensive ravine system. Toronto’s largest living map; Watershed Consciousness is a living work that looks and behaves differently in each season and responds to the changing conditions of its environment. 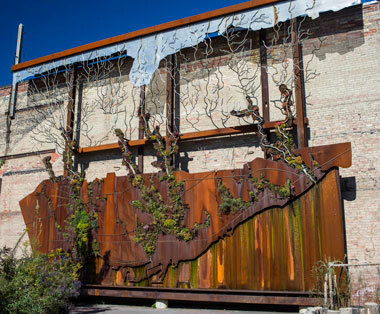 These large-scale sculptural representations of native plants are poetic emblems of the transformed brick factory. They are a reminder of the importance of nature’s place in urban communities, and remind us that the division between nature and the built environment is socially constructed. This installation is a poetic interpretation of the geologically significant north slope. The artwork interprets two glacial periods with an interglacial period between. 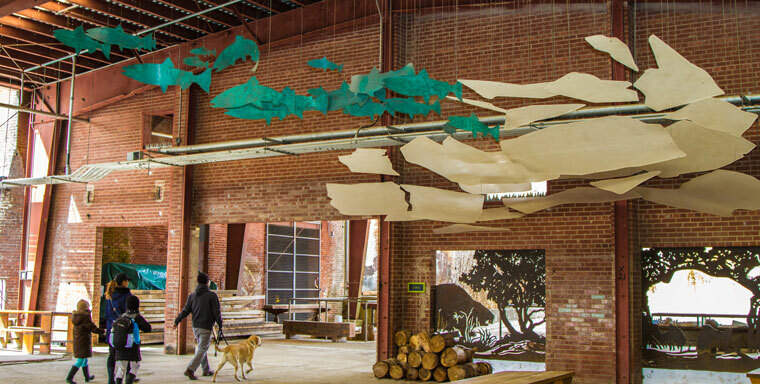 The panels within the doorways represent a snapshot of this interglacial period approximately 120,000 years ago—a time when this place was home to giant prehistoric beavers, bison, deer and catfish—entire ecosystems thriving in a carolinian temperate that was 2 degrees warmer than today. An installation by artist Morgan Zigler and naturalist Lee Earl, Mapping Nature is an open invitation to experience nature, history and storytelling. An old schoolhouse slate and heritage metal lathe have been reimagined to create a map space and display of locally found artefacts and specimens. This interactive display is constantly evolving with the additions of visitors. Located on the ground floor of the Centre for Green Cities, Green Design explores the lessons learned in creating this unique site. 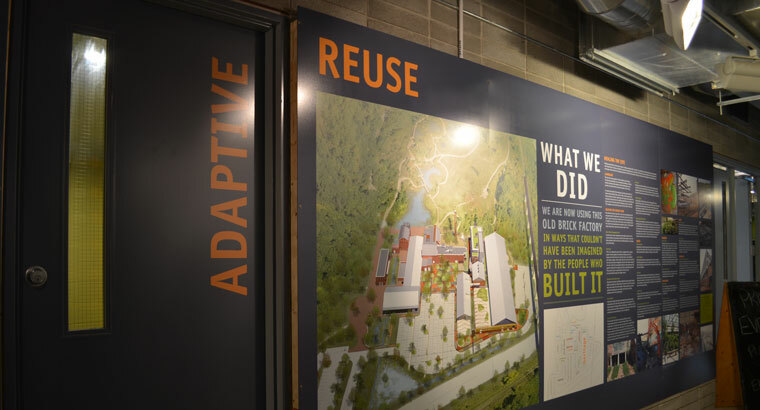 Discover what key features of the project contribute to our LEED Platinum status and learn about the benefits and challenges of adaptive reuse. 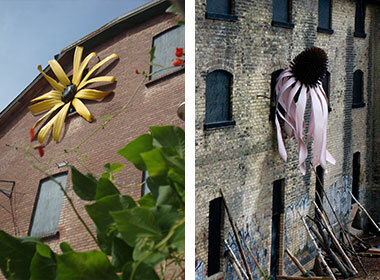 Themes explored include Conservation, Reuse, Remediation, and Sustainability. A representation of the north slope of the site’s old quarry, Where Rocks Talk depicts hundreds of thousands of years of geological history in seven distinct layers. The exhibit shows a region shaped by recurring glaciers, giant lakes and ancient, fast-flowing rivers—long before the highways, streetcars and city neighbourhoods of today. On April 19, 1904, the burgeoning city of Toronto experienced its largest and most devastating fire to date. The Great Fire, as it came to be known, destroyed 104 buildings and has had a lasting legacy on Toronto that continues to this date. 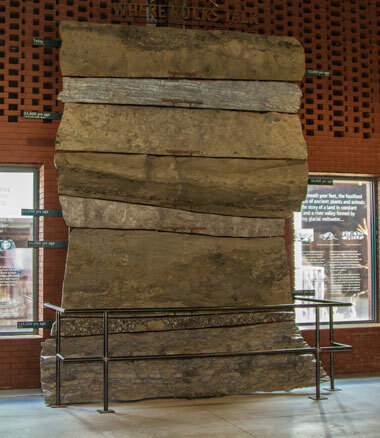 The Great Fire Exhibit explores the damage the fire caused, its impact on Toronto’s heritage, and how the city was rebuilt using the bricks manufactured at Don Valley Brick Works. Archival photos and pages from A.P. Coleman’s notebooks document the rare geological discovery made on the north slope of the quarry. As materials were removed from the hillside to be used in the brick making plant, layers of ice age sediments were revealed—these deposits are some of the very few that remained intact in North America, allowing geologists like A.P. Coleman to study the climates of the previous interglacial periods on Earth.